During 2017, I was asked several times for a data logger program to retrieve data from Kipp & Zonen’s new RaZON+, a compact-sized dual-axis sun tracker with integrated GPS, smart pyrheliometer, and shaded smart pyranometer. 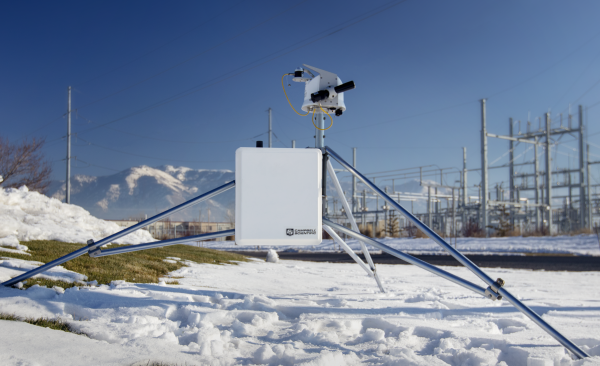 The RaZON+ touts a higher accuracy approach to obtaining solar component sum (diffuse, direct, and global sunlight) compared to the traditional, proven rotating shadowband radiometers. Kipp & Zonen has simplified and improved ease-of-use, as compared to the Solys 2 Sun Tracker, with a compact, lightweight design, onboard data processing, and an intuitive user interface for configuration and Modbus real-time data retrieval. The CR1000X, CR6, and CR310 dataloggers meet these needs, complementing the RaZON+ with integrated Ethernet and RS-485 for Modbus in combination with cellular and wireless data transfer options. For example, the CR310 seamlessly collects the RaZON+’s data every second; measures additional sensors such as a redundant pyranometer, meteorological, soiling, visibility, and temperature; and stores/reduces the data points while performing real-time QA/QC. Coupled with a cellular modem, the CR310 securely transfers data to your favorite database and allows remote and secure access for viewing data and system status. Although the RaZON+ has a nice compact size, the 13W power supply required to meet its power demand will be rather large. Without adding much cost, the CR310 could also be used to monitor and control the power supply, turning the RaZON+ off while the sun elevation is less than 0 degrees on the horizon. The CM106B tripod works nicely for securely mounting and accurately leveling the RaZON+, even in challenging terrain. The program example below is developed for the CR310. The same code can be used in the new CR1000X and CR6 dataloggers, as well as the CR1000, CR800, CR850, and CR3000. Please post below if you have an experience with the RaZON+ that you’d like to share or if you have any questions. Matt Perry is a Technical Product Manager of the Renewable Energy Group, as well as the Chair of the Sustainability Committee at Campbell Scientific, Inc. He also serves on the Logan City Renewable Energy and Conservation Advisory Board. Outside of work, Matt spends time with family and friends, traveling in pursuit of experience and adventure through climbing, time on (and off!) the trail, skiing, and the beach.